If you’re looking for a statement piece of furniture which will add impact to any room then the range of exquisitely handcrafted and carefully curated chests of drawers at Graham & Green is perfect. 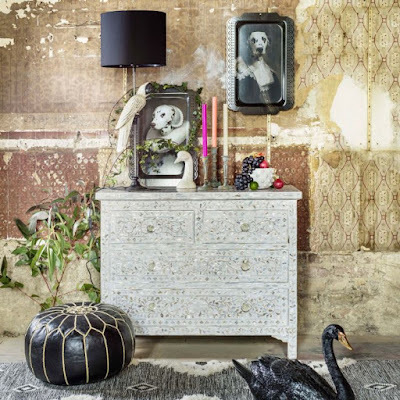 With beautiful mother of pearl and bone inlay embellishment, daring metallics and distressed wooden finishes, all the focus on the detail. 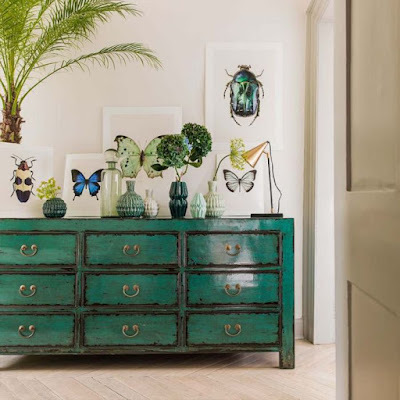 A new addition to our lacquered Chinese-inspired Lijang collection, this nine drawer Lijang peacock coloured chest provides ample storage. Crafted from recycled aspen with a waxed turquoise distressed finish and brass handles. Our Classic White Mother of Pearl Inlay collection is permanently up-to-the-minute in the style stakes. A serious showstopper of a piece that will sit perfectly with both modern & traditional interior settings. Exquisitely handcrafted in Jaipur by a team of skilled craftsmen, individual pieces of Mother of Pearl have been lovingly hand carved and fixed into brilliant white resin, on a sustainable mango wood frame, to create a beautiful floral design. Adorned in geometric mosaics, our Beaumont bone inlay chest of drawers is a beautiful, handcrafted piece of furniture. 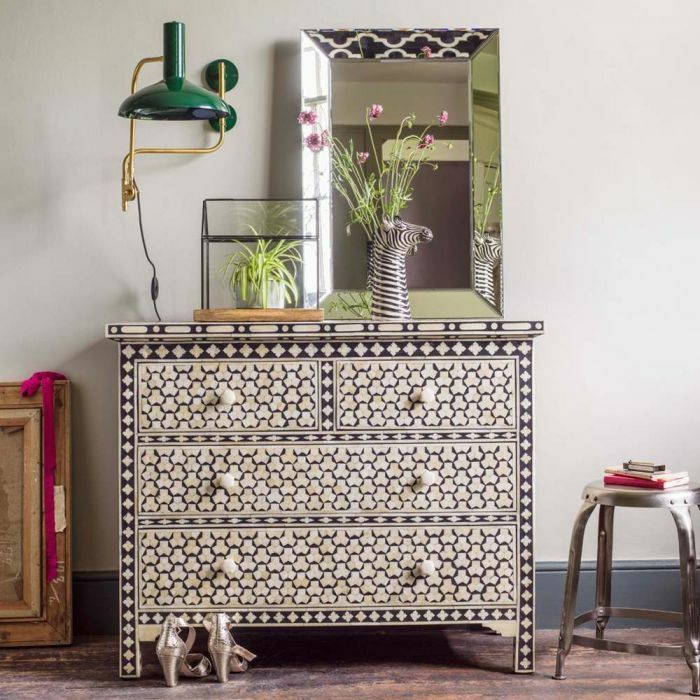 Made using techniques passed down through generations, skilled artisans in Udaipur, India expertly craft this beautifully contrasting black and white four drawer chest, individually finished with a hexagonally shaped handle. 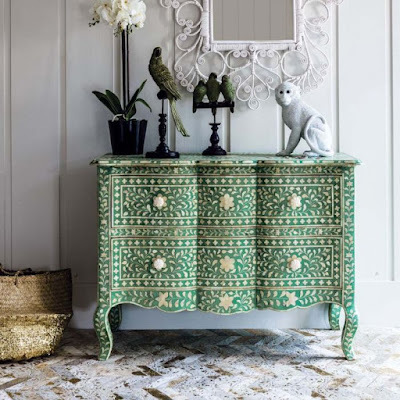 Beautifully handcrafted in India, this French Renaissance style green and bone inlay chest of drawers with elegant curves takes a team of skilled craftsmen many weeks to complete. Individual pieces of ethically sourced bone have been skilfully carved and fixed into resin on a wooden frame to create an intricate floral design. Each drawer front is finished with a hand carved bone drawer knob. 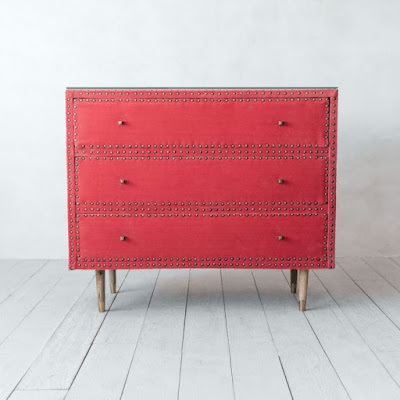 Our sumptuous Eleonora chest of drawers has been upholstered in a vibrant coral velvet and features brass rivet details. 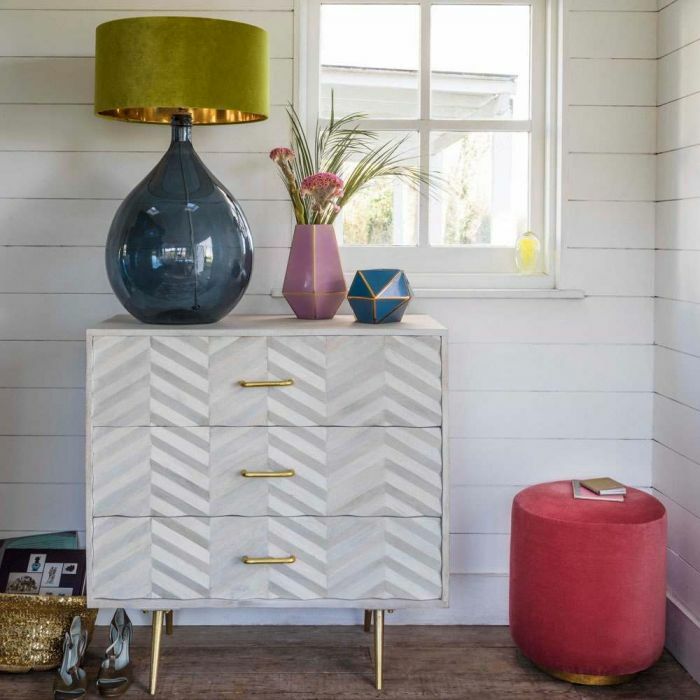 The chest comes with three drawers, brass tipped tapered wooden legs and a protective glass top. Alternative waves of hammered brass fronted draws make the Midas chest entirely unique. Crafted from solid mango wood, the piece is an heirloom worthy investment. The Ariella chevron three drawer chest of drawers presents decadent detailing in the bleached mango wood contoured herringbone design, alongside mid-century styling depicted in the brass handles and tapered legs. With three generous drawers, ample storage space is provided, making this piece of furniture hugely functional as well as a delight to look at. Influenced by pieces found in chic French boutiques, our Chantilly Large Chest of Drawers has been designed and crafted by skilled artisans. 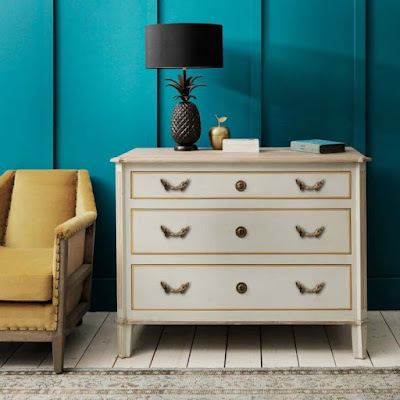 Constructed from mango wood and given a soft grey exterior, this charming three drawer chest is not only practical but stylish. The striking gold trim and rococo inspired brass handles truly capture the elegance and sophistication of Parisian style.